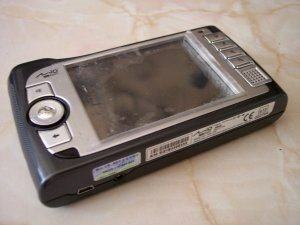 The Mio 269 mobile navigation system is a hand held personal GPS receiver from Mio Technology. This is essentially the same basic system as the very successful, popular and cheaper Mio 268; both have a fully integrated antenna; touch screen; good functionality and excellent build quality in a beautiful, flat package. However, the 269 has a few additional extras such as over 8 million miles of road mapping data (sourced from Tele Atlas stored on an internal hard disk with 500 MB of usable capacity instead of being stored on a secure digital card) and a remote control too, and a 1 year manufacturer's warranty! As I am partially sighted, walking to a new destination has always been a nightmare for me. Now I use my Mio to walk to and from new places then get back home, and it has broadened my horizons fantastically. The mapping software is very easy to use and understand. It gives accurate directions to any locations I want and can recalculate a new path if I missed a turn, I really don't know how I did without this little box. I also like the ability to search for specific points of interest and calculate a route based on the category type rather than the address. I've found things on my back doorstep I would never have known were there! It really will fit in your pocket; unlike most of the TomTom based systems that require a Blue tooth device for your Pocket PC; This self-contained unit has nothing sticking out and nothing that can scratch you, catch you or easily break off. No installation is required - all software and maps are already on the 2.5Gb hard drive, and it is all set to go from the moment you power it up (you must charge it for 8 hours before the first use). Whether you are walking to an address in a new area, driving to a new destination in the UK, or cycling through Europe, this is the answer to all your needs and it will run for about 4.5 hours on a single charge. The Mio 269 includes an MP3 player so you can listen to your favourite music on it too and there's 500 MBs of storage on the hard drive, that's about 8 hours of music. I bought Mio 269+ 5 weeks ago in Taipei preloaded with maps of Europe. It was useful when I was in London last. But I live in Kuala Lumpur and there are no maps for Malaysia to be found. Windows cannot see it as a storage disk and the unit itself cannot see the SD card I inserted into it. I am afraid I had bought a lemon. The unit is well designed physically but this isn't reflected in the software, which is primitive compared to others, at least as it is written for Australian maps. Instructions are often behind the game and inexplicable diversions from the correct route are not uncommon. Being told to make a U-turn "if possible" after the machine has made an error is something I had hoped to eliminate after purchasing this device, but unfortunately not! What is the voice like? Robot-like or easy on the ears? Is there a choice? Bought my MIO 269 early sept in Stockholm. I've then used it 2 times when visiting Switzerland and southern Germany. Both these countries have an intricate and tight network of roads. At the Zurich airport I put my MIO on the front windscreen, inserted the power adapter, started it and chosed Germany as the country of destination. Then typed the first letters of our destination: Schwäbisch Hall. Nothing happened! The only manual supplied was an extensive PDF-file. 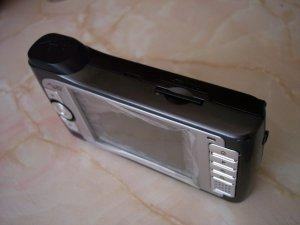 I had it on my LOOX 720 PDA and it took me some time to find the problem. First I had to choose one of the 22 countries - THEN, it worked just fine. Without this, there are "only" the larger towns (with some major roads), highways and main roads (with exits and turns) covering all Europe (with gas stations, McDonalds etc.)! So, we started our 306 Km trip anyway - and everything went just fine. MIO 269 kept track on every turn even what line to choose. The directions where extremely accurate with a female voice presented smooth and pleasantly. When running at 180-200 km/h I appreciate accuracy. Even after long tunnels, the sensitive built-in antenna picked up the signal within 2-5 seconds! That was very helpful at some decision points. Finally the newest release of MIO 269+ has the option to add POI, like Speedtraps etc. Either way - I do recommend MOI 269. Absolutely disgusted with it. Hate it. 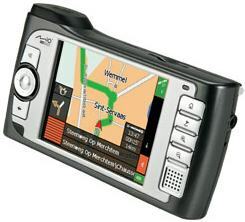 I have owned 2 Pocket PC GPS products, one being a Navman (basically a MIO rebranded) When on holiday in Belgium I bought this and I have to agree witht he above review. The only word I can find to sum it up is shite. As for directions!!!! Forget it. I have tried it in numerous towns and cities and it is always running way behind you, so it tells you to turn left at next junction (which you do) and after driving for 3 or 400 metres on the new road, it then tells you....TURN LEFT NOW!!! and you do....... and it was actually referring to your last turn, so it gets you lost again which is bloody annoying in some places ESPECIALLY towns or cities with heavy one way street systems!!!! Its rubbish, you cant find more the 50% of the roads and you have to be sure in which city the road is in. If you dont know the city/village/ group of buildings you have to wait until hell freses over until you get there. My advice is to throw the "shite" out the window, preferably while driving. This is one of the best review I seen to date on the Mio 269. Will the Mio 169 be reviewed as well in the near future? As I understand, the 169 uses the new SiRF Star III GPS module, while the 269 one has an older version. Any idea if/when the 169 model will become available in the states? Since I use my PDA frequently and and the 169 uses the latest and greatest GPS module, I'm leading toward the 169 as a future purchase if and when it's available here. The 269 is good too, but it lacks the PDA part. I can't understand why the company will choose to lock out the OS functions from the device. Is there a review available that compares the SiRF II vs. III? I have gone through many reviews on GPS devices and many have shortcomings with their GPS precision. I hope both these Mio models will not suffer the same fate.